The Lexus IS F’s path from production car to racing version has been a long and convoluted one. Starting with a grainy picture and initial information of the Lexus IS F Racing Concept which were followed by real-life pictures of its debut at the 2008 Tokyo Auto Salon courtesy of my.IS member David Huang (screen name IS300eR) and then veering off to the ever more outrageous stories of it either evolving into a mid-engined sedan racer or evolved from a 2004 Opel Vectra DTM racer, we were left to wonder if it would all ultimately self-implode into a big pile of vaporware. Finally, however, the drawn-out tease of a wait is over. We are about to see the Lexus IS F compete on the racetrack. And, best of all, you needn’t hop on a plane to Japan or Europe, for it will be making its racing debut at the upcoming SPEED World Challenge GT Series race at the storied Mid-Ohio Sports Car Course in Lexington on Sunday 20 July 2008 at 4 PM, the final event in a racing-packed Mid-Ohio weekend that also includes American Le Mans, Indy Lights, Indy Car and SPEED World Challenge Touring Car races. The mention of the latter series begs for some clarification. SPEED World Challenge racing consists of two distinct classes: the slower Touring Car class and the faster GT class. The Touring Car class is where the 1st-generation Lexus IS 300 has seen action, under both Tim Pappas’ Team FBR/Trans Sport Racing and Andy and Andrew Wojteczko’s Auto Analyser Racing teams. A key rule in the Touring Car (TC) class is that engines may be no larger than 2.8 liters, which the Lexus IS 300 complies with via destroking (and making it, in essence, an IS 280). On the other hand, Grand Touring (GT) class rules are much broader, including a variety of production displacements with no maximum. Forced induction is permitted and is used to equalize individual models. Sedans, coupes, convertibles and two-seat models are permitted. The cars can be rear-wheel, or all-wheel drive. Class horsepower range is 350-550 bhp. At this time, fully detailed specifications are not available, but we do know that the SPEED World Challenge Lexus IS GTF, which was engineered and built by Greg Fordahl and the team at Redmond, Washington-based Fordahl Motorsports after an almost year-long effort, will be running is a purpose-built 4.7-liter V8 race engine that puts out just over 510 hp via a Hewland 6-speed sequential transmission. The base weight for the car with driver is about 2900 lbs, and this is one of those racing series that uses the same spec tires for all, in this case Toyo Proxes RA888s, in a 295/35-18 size for the front and 335/30-18 for the rear in the IS GTF. Further proof of the caliber and determination of DRC Motorsports is in their choice of drivers, neither of which are newbie rookies or dilettantes. The Mid-Ohio race will see only one of the team’s two cars in action, the #72, piloted by Jeff Altenburg. Jeff is the 2007 SPEED World Challenge Touring Car Champion, at the wheel of the #1 Mazda6. After running the second TC event of the 2008 season (at Virginia International Raceway), however, he quit the Mazda team to join DRC Motorsports, which has allowed Jeff to run in a Porsche 911 GT3 while his Lexus was being prepared. 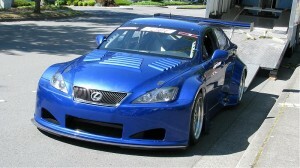 Hopefully, the race following the Mid-Ohio event, at Road America in Elkhart Lake, Wisconsin on Sunday 10 August should see the team’s second Lexus IS GTF racer ready to compete: the #02 car, driven by Robb Holland (my.IS member WC IS350 GT). Robb’s racing career actually started on two wheels, and not the motorized kind. He captured two cycling National Championships before competing professionally for 6 years at the top international level against stars like Lance Armstrong. After retiring from professional cycling, Robb changed to four engine-powered wheels, and the SPEED World Challenge Touring Car series, competing in a Dodge (Neon) SRT-4 during 2006 and 2007. During several 2007 and early 2008 season races, Holland, like Altenburg, has driven SPEED World Challenge GT events in a Porsche 911 GT3. Rest assured that we at my.IS will be following the progress of the DRC Motorsports Lexus IS GTF racers just as diligently as we do the Grand Am Daytona Prototype Lexus-powered racers. And for those of you unable to see it live at Mid-Ohio, SPEED TV will be broadcasting the SPEED World Challenge GT race on Thursday 24 July 2008 at 10 AM Pacific Time / 11 AM Mountain Time / 12 Noon Central Time / 1 PM Eastern Time.